This website uses own and third party cookies to give you the best experience. If you continue browsing, we understand that authorize the use of these cookies. 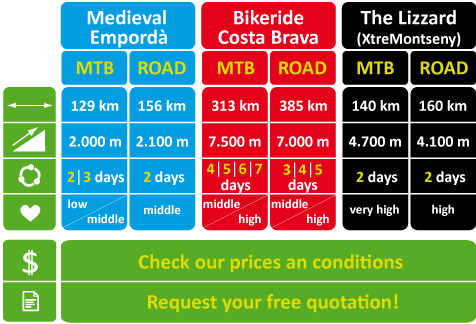 Rutes en bici de carretera o btt per la Costa Brava, Girona i Barcelona. Have you ever dreamt about riding your bike around one of the most spectacular areas by the Mediterranean? We offer you an excellent chance to do it in one of the best destinations you can travel to, not just from our point of view, but also according to the National Geographic magazine. Come when you want (we open all year) and cycle at your own pace, with no hurry and without caring about accommodation, because all our hotels meet all the cyclists’ needs. You neither have to worry about luggage or assistance; just do what you like best: cycling. You see, we take care of everything! You can ride with one of our professional guides but no problem if you prefer to go alone just to make it a little more adventurous. You can have one of our GPS devices specially programmed with the tracks for free. You will see how easy it is to follow your MTB or road route. Why shouldn’t you miss our bike rides? Route Empordà Medieval: The most beautiful route and the best way to know the Costa Brava. Although this is our easiest track, it will leave a footprint on you. 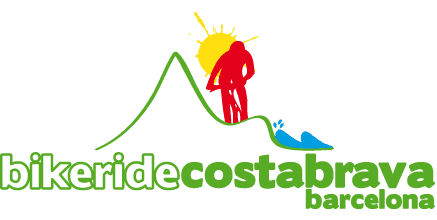 Route Bikeride Costa Brava: All the landscapes in the most complete route. A turning point in your touring experience. Route of the Lizzard (XtreMontseny): The most demanding track. You will always remember it. Only for real bicycle fans. Do you dare? 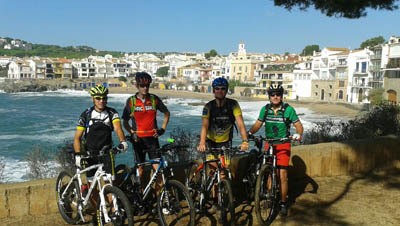 "These days I have been touring the Bikeride Costa Brava and I have enjoyed a lot, with the landscapes, the rural atmosphere, the coves of the coast, the Mediterranean atmosphere, the colors, the lights, the gastronomy, the hospitality, the kindness of Kiko and David ... in short ... a unique experience highly recommended for all cyclist fans. See you soon friends." 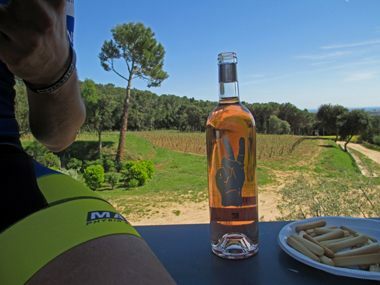 "A few days ago we made the route through the Empordà quietly in three stages, perfect organization, the treatment by David and Kiko (in person) unbeatable. Girona and the villages of passage are the ones to know, especially the old town of the capital and Peratallada (as well as the central square of Monells). Route, tracks, accommodations,… all very well. There are beautiful and easy trails, as well as almost no pavement. Highly recommend. 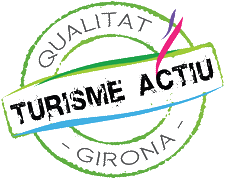 Thank you very much for everything, the next route the complete route on the Costa Brava." "We've spent a great time and we have been concerned only pedaling, they take care of the rest." "It was one of the best experiences I've lived on a bicycle. 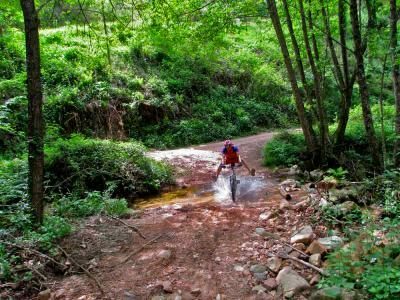 Demanding and beautiful route that has made me know or rediscover places in our country from a very different point of view (on a bike).It is a highly recommendable and repeatable experience!!" "I will recommend to my friends. We love to come back and repeat some other route with you!" 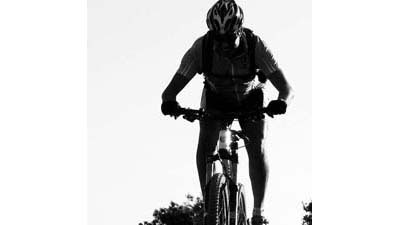 We are specialists in bicycle tours. also prepare a custom route for you.